Reverie produce induction kits designed for Lotus, MG, Renault and Saab vehicles. Our kits are based on our Daytona Air Induction filter kit and can be used in conjunction with our air boxes or used with the standard intake system. 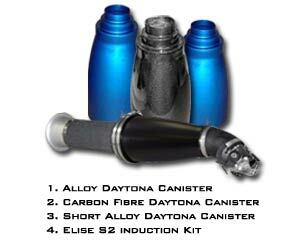 The Daytona kits can be specified with Alloy of Carbon Fibre filter canisters, everything you need is included in the kit. Our carbon fibre canisters are autoclaved to achieve the best finish and longevity.